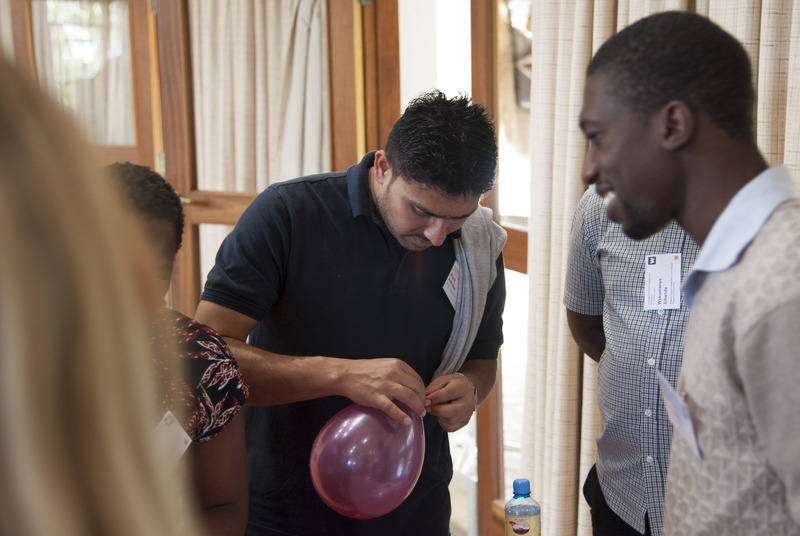 Alexander Adadevoh from Lab 13 Ghana demonstrates how creative hands-on activities can be used to stimulate investigation, curiosity, discussion and learning in science. The activity requires participants to explore floatation by using their creativity and imagination to make a sinking object float; and a floating object sink, learning about density as they do so. The activity is aimed at ages 8 to 16 and takes approximately two hours. Caption: Delegates at the 2017 Wellcome Trust International Engagement Workshop try out the activity for themselves. There are two approaches to this activity, depending on the prior knowledge of the participants involved. Both approaches are easily replicated and all the instructions and materials needed to do so are below. The equipment and pre-activity questions are the same for both approaches. Leave around 2 hours for the activity: 50 minutes for set up, introduction and questions; 50 minutes for the actvity; and 20 minutes for the round up. 1. Will two plastic cups containing, to the same volume, sand and salt have the same density? 2. Will two plastic cups, filled to different heights, of sand have the same density? 3. What will happen to the density of the resulting object if one of two plastic cups, filled with sand to equal volumes, is transferred into a rectangular box. Will the density of the sand change? Students are given the materials and asked to find a way of making the floating object sink and the sinking object float. Students are encouraged to work in groups. Students are awarded marks after the activity based on certain criteria such as the first group to finish, presentation, creativity and explanation. Students are asked to explain the idea or reason behind what they did, and why they did it. Round up by making comparisons from their outcomes and trying to get students to understand why there were differences. Summarise the purpose of the activity to further put what the students have learnt in perspective. Students are giving the materials and asked to find a way of making the floating object sink and the sinking object float. The objects weights and volumes together with the weights and volumes of the water they occupy before and after the activity are determined and recorded in a table attached to the lesson. Students are then asked to complete the discussion sheet and calculate the densities. Students are asked to extend the knowledge they have acquired to try and find out why they think a ship sinks even though it is made up of metal. The content on this page forms part of the online report for the 2017 International Engagement Workshop "It's Complicated: navigating scientific complexity in public and community engagement". To read more about hands-on and school engagement visit the school engagement and hands-on science theme from the workshop. To read more about the full workshop and access the rest of the report including video presentations, discussion summaries, and tools, visit the workshop page.